I am Chieu, President of the Women’s Union in Tong Sanh commune and a mother of 2 kids – my son is seven-years-old and my daughter is three. I also have been a community volunteer with Save the Children since October 2015. When I started working with the Sponsorship program I felt wonderful, because I always aspire to devote my enthusiasm and time to helping those living in poverty. Happiness is now here, where I can frequently see our kids playing and learning in a safe environment. 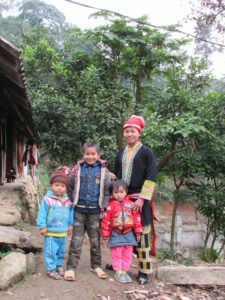 Chieu with her son, nephew and daughter. My homeland is very poor. Most of the territory is hilly and income totally depends on the rice or corn harvest. Come rain or shine, most children only have a few light clothes to call their own. In school, due to the lack of learning and teaching materials, students would just play with old toys or roll about aimlessly in the mud and sand. 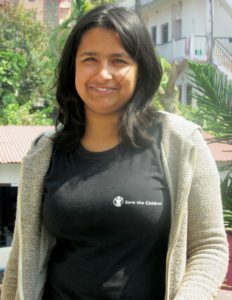 Since Save the Children started working in Tong Sanh, it has supported my children and the children of my neighbors. As a result my homeland has changed a lot. One day, when I picked my daughter up from kindergarten, I suddenly saw in the schoolyard a new outdoor play area decorated with colorful painted car tires. My daughter was beside herself with excitement, and told me, “Mommy, today I felt so happy while playing with the slide, which I could see on television but couldn’t touch before.” Around the same time, my son shared with my husband and I that his school had a new water system, and he was learning about washing his hands with soap. I was so happy because our children no longer had to play in the dirt, and could wash their hands with clean water whenever they wanted! I met with my kids’ teachers to express my gratitude for the positive recent changes I’d seen. They said that all those things were thanks to Save the Children Sponsorship support. I felt very excited and looked forward to having a chance to learn more about Save the Children. That chance came when the Vice Chairman of Peoples Committee for our community informed me that Save the Children was seeking community volunteers who would commit and be willing to take on the responsibility of being the connection between sponsors and sponsored children. To be honest, at that time I was vague of what all those words really meant, but I simply understood that I could contribute to the community’s development through participating in these program activities. 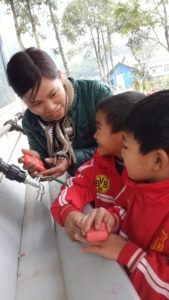 Chieu training school children on how to wash their hands with soap. I remember vividly the most impressive task I completed was the first child enrollment campaign at the local primary school. Save the Children staff took portrait photos of children, while teachers guided students on writing letters, and I interviewed parents to collect the family’s information. Since this was the first enrollment campaign at this school, both students and their parents were a little nervous, but so excited too. Everyone involved gave their support and active participation to ensure the day’s activities went smoothly. While working in the field, I’ve seen the bright smiles and happy faces of the children Sponsorship reaches. I realized that choosing this job was absolutely correct. Children will have better learning conditions with new latrines, new classrooms and teacher training courses – none of which would we be able to access without Save the Children support. Thank you, sponsors, so much! Christine, a nine-year-old girl and second born in a family of five children, lives with her parents and is enrolled in the Save the Children Sponsorship program in Uganda. In the past, Christine was often sent away from school, not able to attend without the basic requirements like paper and books. When she was permitted to stay in class, she was not able to take any notes because she had no notebook to write in, preventing her ability to learn. Senior Officer Madrine helps Christine compose a letter. “Before I joined Sponsorship, I would feel sad going to school without exercise books, pencils or anything to color with. I would often be sent home from school because I didn’t have a book for a particular subject,” remembered Christine quietly. As a result of Sponsorship funds, the community has been provided with enough scholastic materials to ensure all children are able to go to school and learn. Today many more children, including Christine, enjoy being in school thanks to this funding. Christine was very excited to receive a pack of books, lead pencils and colored pencils from Save the Children, which has enabled her to develop a love of learning. In addition to the scholastic items, Christine receives frequent correspondences from her sponsor that she happily replies to. We’ve found that letter writing increases children’s interest in reading and writing and their engagement in their studies. This is certainly true for Christine, whose reading and writing skills have greatly improved – she proudly boasts her handwriting is the best in her class. 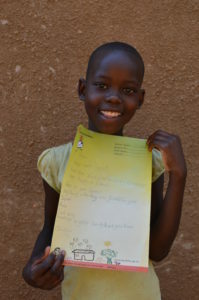 Christine proudly holds the letter she’s finished for her sponsor. Also through Sponsorship program interventions, Christine has learned how to stay clean and healthy while at school, by keeping her fingernails short and by washing her hands with soap before eating food and after visiting the latrine. Christine is very optimistic that she will finish school and achieve her dream of becoming a nurse one day. She is very grateful for her sponsor’s support and encouragement. Her sponsor’s words help motivate her to continue being dedicated to her studies. 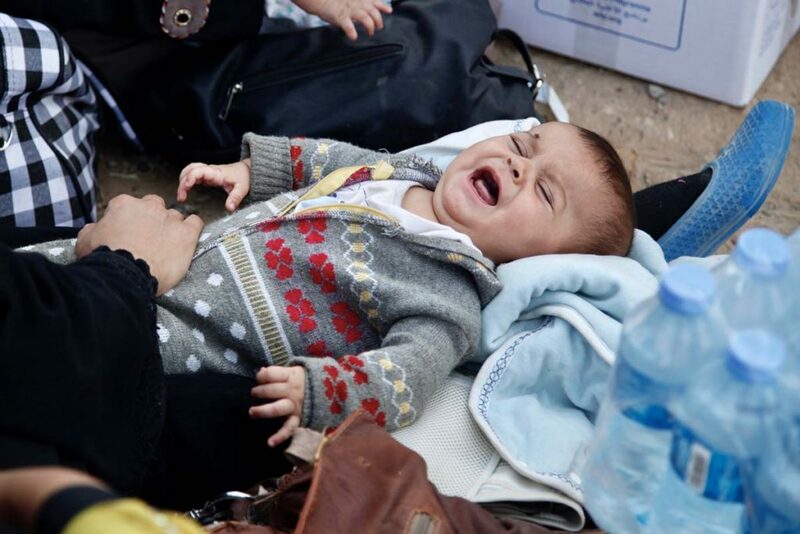 6-month-old baby girl *Sara cries at Dibis checkpoint near the Iraqi city of Kirkuk. A dusty police station in northern Iraq is a strange sort of paradise. But that is what it is to the eight families crammed in here on the hard, tiled floor. Babies are crying and young children are sleeping where they collapsed from exhaustion. They have walked over 60 miles, and scaled a mountain last night, to escape territory held by the Islamic State group. 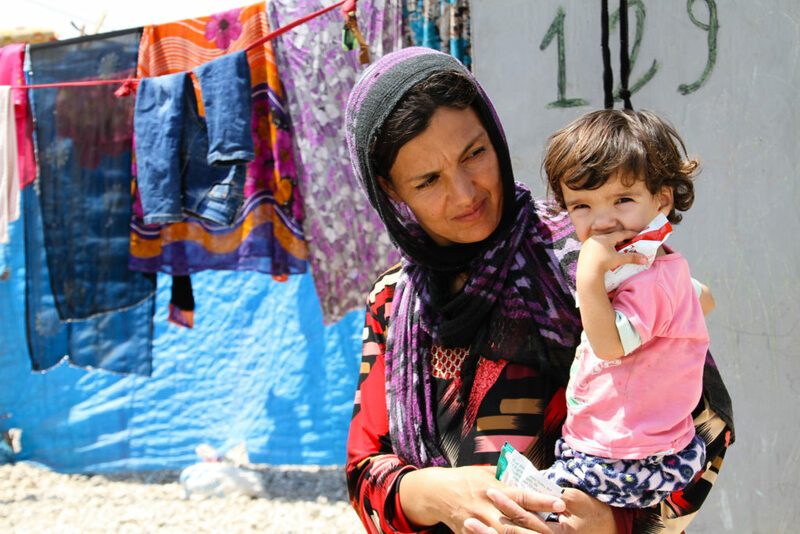 The Nour* family arrived at Garmawa IDP camp in late 2014, displaced by the fighting between armed groups in Iraq. The youngest of their six children, Sera*, was only 11 months old at the time and suffering from malnutrition and a host of subsequent health issues. Save the Children is working with the family to ensure that they are accessing health services, as Sera’s health is still fragile. These parents tell me that they are lucky. They show me graphic images of families who did not make it on their cell phones. Pictures of children who dodged IS snipers and checkpoints, only to step on land mines sown into fields and mountain paths. Others collapsed and died on the journey after running out of water. One woman says she paid thousands of dollars to smugglers — only to be pointed in the vague direction of freedom and then abandoned with her family to stumble down deadly routes in the dark. I hear stories like these every day. Families are growing increasingly desperate to flee with their children before the final assault. And they’re ready to risk capture and execution by IS fighters. 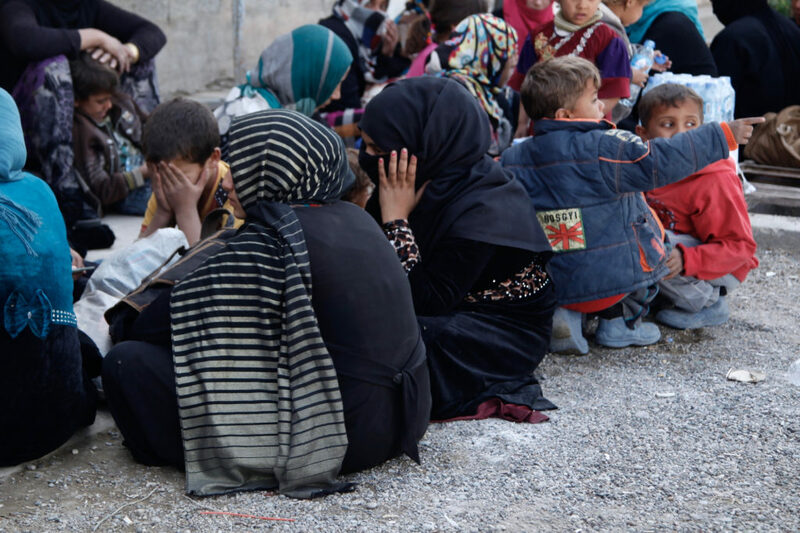 A group of mothers sit with their children at Dibis checkpoint near the Iraqi city of Kirkuk. We have already seen at least 150,000 people flee their homes in recent weeks, and more are on the move every day. When the final push for Mosul comes, the U.N. and aid agencies like us on the ground are expecting an exodus of a million, maybe more. What we’re witnessing now in areas recently captured from IS by the Iraqi army, suggests they will need everything — water, food, shelter and psychological first aid. “We have nothing but our clothes!” one man shouted out to us when we arrived with help. The only memories some young children have is of a long and brutal two years of IS rule. Families told us they had resorted to desperate tactics to feed themselves under IS rule, some even cooking grass to eat. Save the Children is providing emergency water supplies, dried food, soap and other items to newly displaced families. Every family I meet has their own harrowing tale. As the offensive fast approaches, Save the Children is gearing up our response plan to cope with the incredible level of need we expect will flood out from the city. By our estimates there are 600,000 children trapped inside right now. Within 12-72 hours from the call to deploy, we aim to get emergency supplies to those that need them. And we aim to provide proper care for children traveling alone, reuniting them with their families where we can. But across the board there is a shortage of funding. The UN has raised less than half of the money it needs for what is likely to be the biggest humanitarian crisis for many years. We need more help. In the violence of this assault, children must be kept safe while they are fleeing — and protected if they make it out alive. Learn more about how you can help us protect vulnerable children caught in the crossfire. As Iraqi and coalition forces begin their assault on Mosul, the lives of more than half a million children are hanging in the balance. The escalation in the conflict is forcing families to make an impossible choice. Stay in their homes and risk being killed in the conflict, trapped beyond the reach of humanitarian aid without food and medical care, or flee into the heart of the fighting on unsecured roads, facing an uncertain future. 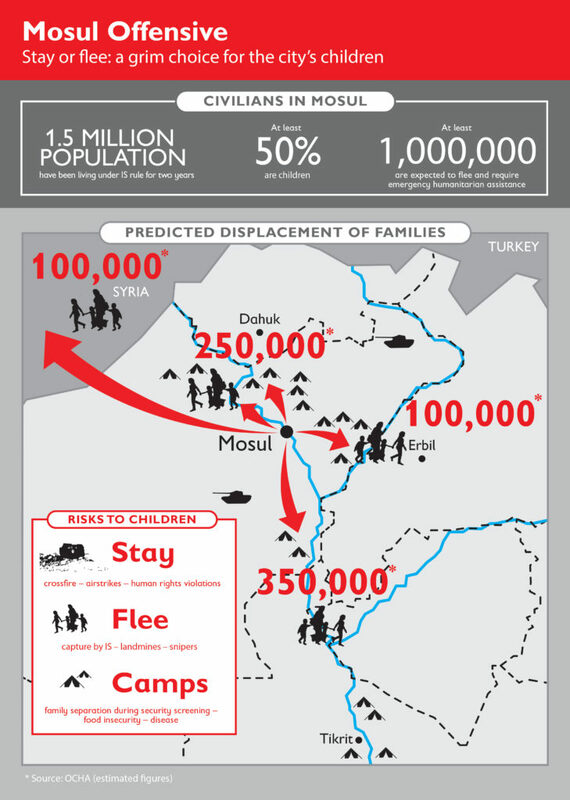 Graphic showing the desperate situation for the residents of Mosul as the offensive begins. Families inside Mosul say they cannot afford to buy food, water and basic medical supplies, and have been preparing shelters inside their homes in case of bombardment. Many say they are too scared to leave the city until the roads out are secured. 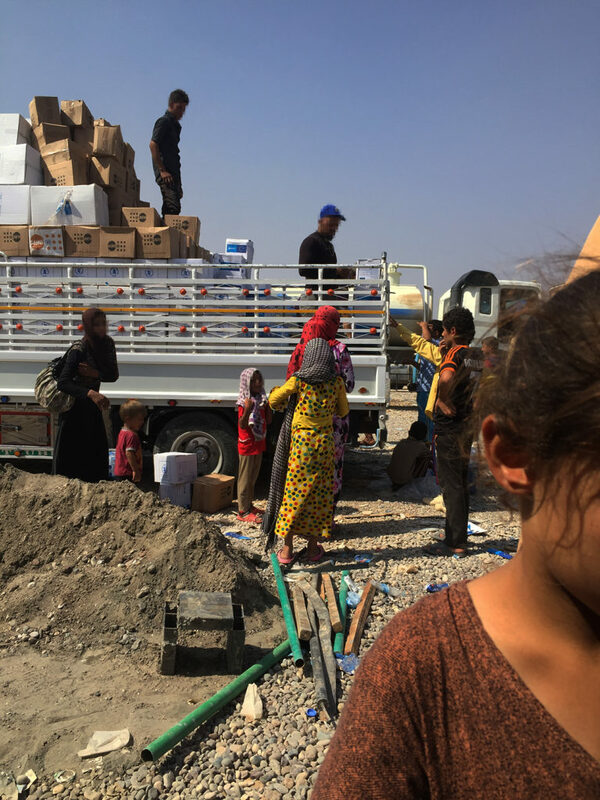 Rapid response distribution for new arrivals at a screening center in Salah ad Din province, Iraq. 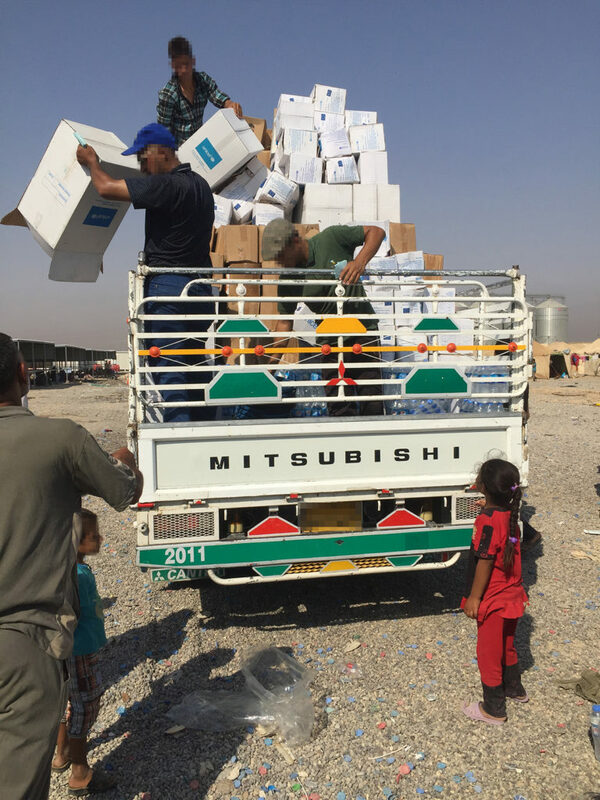 These trucks are loaded with boxes pre-positioned for newly expected arrivals from areas of conflict in the north as a result of the impending Mosul offensive. At least 150,000 people have been displaced so far and the offensive could force over 1 million people to flee their homes. Military commanders have asked vulnerable families to stay inside and put white flags on their homes. At best this is impractical in a brutal urban conflict. At worst, it risks civilian buildings being turned into military positions and families being used as human shields. 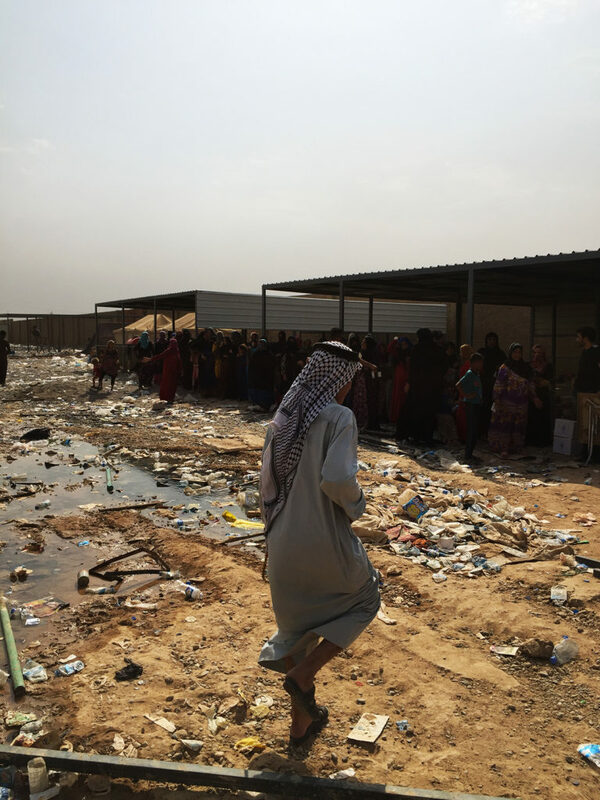 A man walks through the dirty screening center to line up for distribution. We are currently involved with waste management to clean the screening center of rubbish and make it more livable for internally displaced persons who are stuck in the area. Those who attempt to flee the city face booby traps, snipers, and hidden land mines. It’s impossible to fathom, but many families are currently seeking refuge in war-torn Syria, with about 5,000 people, mostly women and children, arriving at the Al Hol Camp from the Mosul area in the last 10 days, and at least 1,000 more are now massing at the border waiting to cross. 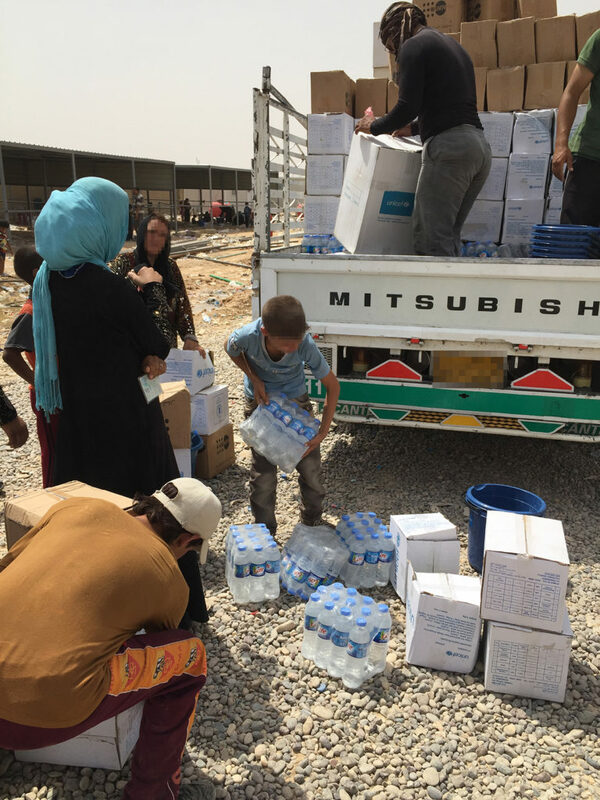 Rapid response distribution for new arrivals at a screening center in Salah ad Din province, Iraq. If people do manage to escape, they also face an uncertain situation. At the moment camps are ready for only around 60,000 people — a tiny fraction of the up to 1 million people who could flee Mosul. The UN’s emergency appeal is still only half funded, but camps could be overwhelmed within days. A new family receiving their RRM kit: 1 Hygiene Kit, 1 dignity kit, 1 food kit and 2 containers of water. Save the Children is calling for safe routes out of the city to be immediately identified and maintained, and cleared of deadly explosives. The safety of children must be made a priority. 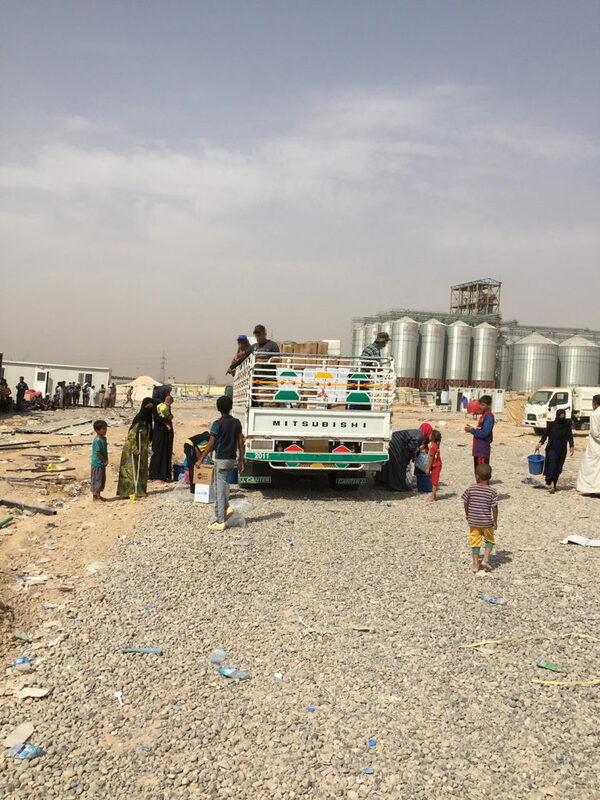 Distribution in Salah ad Din province – trucks being readied to meet new arrivals at screening. Our teams are already seeing people making dangerous journeys to get out ahead of the offensive. 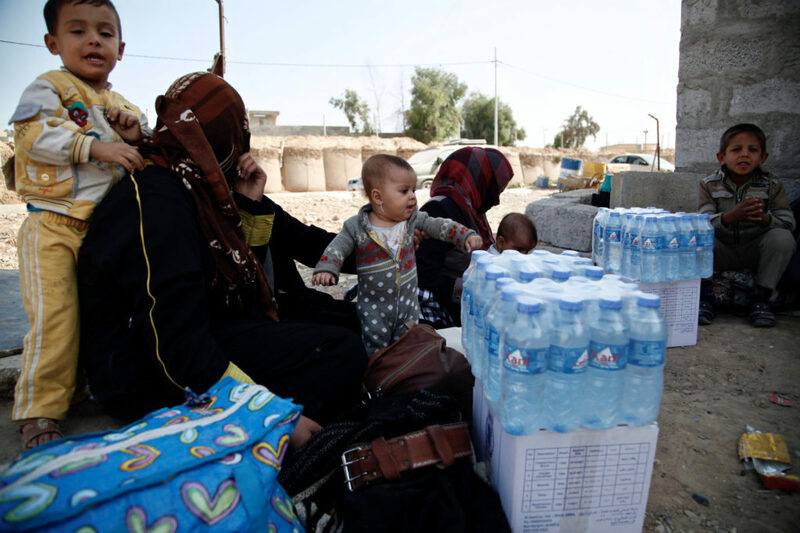 Thousands of families are escaping the area around Hawija and at least 5,000 people have fled villages around Mosul and crossed into northeast Syria in the past week, and are living in desperate conditions across the border. We are in the region working to provide emergency water supplies, dried food, soap and other items to newly displaced families. Learn more about our work in during this crisis and how you can help. It was during one of my regular visits to a Sponsorship supported school when I met Kajal. Attentive, curious, interactive and joyful, Kajal was participating in all her class activities with great enthusiasm. She looked like all the other kids throughout the class, reading and writing alongside her classmates. It wasn’t until she walked up to her teacher with a question that I realized that her legs were weak and uneven, and that she could not walk properly. Kajal practicing newly learned words. I wanted to know more about this bright eyed girl. So, I inquired about her with her teacher. Her teacher excitedly shared that their village, with a total of six schools, would not have reached their milestone of 100% enrollment in the current academic year if Kajal had been left behind at home, like she was the previous year. Save the Children has been very persistent in getting every last child enrolled in school. Seven-year-old Kajal used to stay at home while the rest of her family, made up of her parents and two elder siblings, went about their own business outside of the house. Nobody in her family believed that schooling would do her any good, due to her condition. Kajal showed me how she wrote her name. Her name means kohl, which is used to line one’s eyes in Nepal. She also showed me her drawings and read to me from her grade one book. Since she did not go to Save the Children’s Early Childhood Care and Development center before grade one, like so many of the other kids in her community did, she has a little difficulty in reading and writing. But Kajal doesn’t let that stop her from learning. I saw this myself – when she had trouble writing a word she didn’t know, she asked for my help, then shyly handed me her paper and asked if I would check her classwork. Every year, out-of-school children are identified in the communities where we work. Kajal (first left) engaged in the days lesson. We reach out to their parents and advise them about the importance of enrolling their children in school. Those out-of-school children, which often includes children with special needs like Kajal, are brought to school with sponsorship supported programming that includes parent orientations, door-to-door visits, counseling sessions and educational material support to ensure that no child is left behind at home. Kajal’s success is just the beginning of what we hope to achieve for the children of Nepal. All of us here at Save the Children in Nepal-Bhutan are eager to continue working in these areas – to commit each parent to sending all their sons and daughters to school. And with our sponsors by our side, they will, because every last child matters. Gloria has accomplished much in her 57 years on this earth. 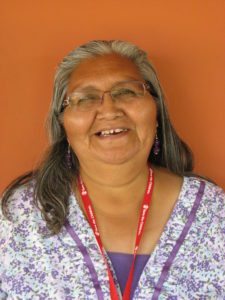 Born in 1959, she continues to live in the land of her birth. She has raised 2 children, and now has 4 grandchildren, 2 of whom she also raised herself, Anthony and Anfernee. The twin boys, now 19, and their successes are her greatest testament to a life well lived. Gloria is the perfect example of Save the Children’s work coming full-circle. She was a sponsored child herself growing-up, and has many fond memories of corresponding back and forth with her sponsors. That relationship left a life-long impact on Gloria. 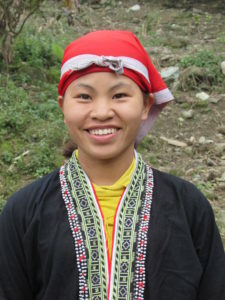 Her sponsors’ encouragement to pursue her education led her to be one of the few in her community to go on to college. 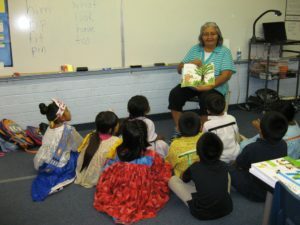 Gloria reads a story to children during our literacy programs. Growing up in Arizona, the east coast of America might as well have been another country, but Gloria’s sponsors – a couple who sponsored her jointly – painted vivid pictures through their words in letters to her, so that she could imagine such a place. They talked about pets, school and what Gloria’s life was like with her family on the reservation. 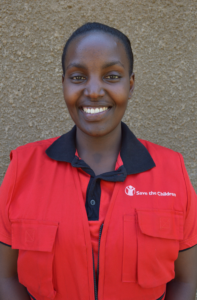 Today, Gloria is proud to be the Save the Children Program Coordinator for one of the schools we partner with. She has over 9 years of experience in that role, and truly grasps the fundamental importance of Sponsorship programs, and their ability to enhance children’s lives. She has also been working as the Sponsorship Liaison for 2 years, and enjoys facilitating the relationship between sponsors and children through letter correspondence, as this was the very relationship that she enjoyed so much as a child herself. 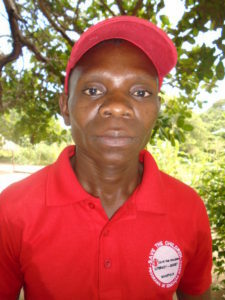 Gloria works with Sponsorship programs to help children develop a love of reading. Gloria’s daughter was sponsored, as were her twin grandsons. Anthony and Anfernee participated in Save the Children literacy programs and went on to graduate high school this past year. Their success is Gloria’s success, and our success! Gloria’s personal relationship with sponsorship is so special to the rest of the U.S. Programs team, and the children we work with too – a living story of sponsorship success! 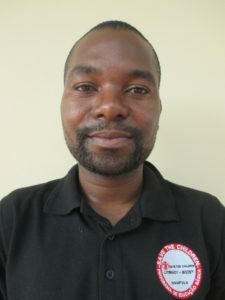 Salimo and Arcangelo are two volunteers from the community of Patone, who support Sponsorship program activities with Save the Children in Mozambique. Thanks to sponsor support, Salimo and Arcangelo are able to help implement Literacy Boost programs for children of friends and family members, in the village they call home. This program is based on years of experience and evidence of what works in teaching children to learn to read: a well-trained teacher, plentiful and interesting books to read and a supportive home environment. Having seen the gaps in the early literacy skills of the children of Patone themselves, the two young men know the potential that Literacy Boost has to make improvements. Volunteers Salimo and Arcangelo facilitating a reading camp session. When asked about what motivated them to volunteer their time, they said that they commonly see many school children above grade 3 who unfortunately cannot read or write. If children at this stage don’t have basic reading and writing skills, it’s very difficult for them to proceed with their education and continue into higher grades, often resulting in discouraged students dropping out of school entirely. For those who don’t drop out, children who lack these skills may need to repeat their early grades two, three or even more times. Eventually, their parents lose interest in sending their children to school because they feel they will not succeed, and pull them out so they can help with house chores or farming. Arcangelo is proud to be a community volunteer with Save the Children. Salimo and Arcangelo know how crucial reading and writing is in the learning process, and that children cannot learn everything at school or by themselves. 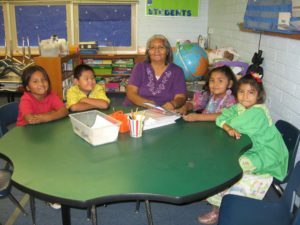 They know that learning takes place both inside schools and out, so it is important to work not only with teachers, but with parents, other community literacy volunteers and youth to create a holistic reading program. For this reason, the volunteers advocate throughout the community for the inclusion of parents and caregivers in their children’s learning process. Also in their role as Sponsorship volunteers, Salimo and Arcangelo join the children after their lessons, providing them guidance and encouragement in their reading and writing. Putting the children in a learning environment after school helps to complement what the teachers do in the classrooms. 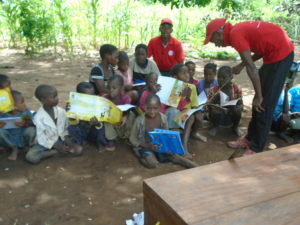 Their goal is to work to guarantee that more children can read and write during their first year of primary school. With the continued support of our dedicated family of sponsors, we can see that dream realized for Patone. All the way from Mozambique – Salimo, Arcangelo and the children they work with send their thanks!